Biology Parasitoids of larva of cyclorrhaphous Diptera, or Hemerobiidae and Chrysopidae (Neuroptera), or Syrphidae (Diptera), or parasitoids of cynipoid or chalcidoid gall inducers, or hyperparasitoids of Hemiptera through Braconidae or Chalcidoidea. Ashmead, W.H. 1900. Notes on some New Zealand and Australian Parasitic Hymenoptera, with descriptions of new genera and new species. Proceedings of the Linnean Society of New South Wales 25: 327–360. Buffington, M.L. 2012. Description of Nanocthulhu lovecrafti, a preternatural new genus and species of Trichoplastini (Figitidae: Eucoilinae). Proceedings of the Entomological Society of Washington 114(1): 5-15. Cameron, P. 1904. Descriptions of new genera and species of Hymenoptera from Dunbrody, Cape Colony. Records of the Albany Museum 1: 125-160. Benoit, P.L.G. 1956. Figitidae - Aspicerinae nouveaux du Congo Belge. Revue Zool. Bot. afr. 53: 195-204. Ferrer-Suay, M., Selfa, J. & Pujade-Villar, J. 2012. First record of Alloxysta Förster from Madagascar, with descriptions of two new species (Hymenoptera: Cynipoidea: Figitidae: Charipinae). African Entomology 20: 222-228. Ferrer-Suay, M., Selfa, J., Pujade-Villar, J. 2013. 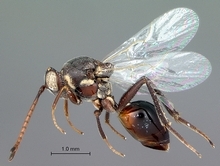 A review of Alloxysta species (Hymenoptera: Cynipoidea: Figitidae: Charipinae) from Africa. African Entomology 21: 255–266. Fontal-Cazalla, F. M., Buffington, M. L., Nordlander, G., Liljeblad, J., Ros-Farré, P., Nieves-Aldrey, J. L., Pujade-Villar, J. & Ronquist, F. (2002). Phylogeny of the Eucoilinae (Hymenoptera: Cynipoidea: Figitidae). Cladistics 18, 154–199. Paretas-Martinez, J.; Melika, G.; Pujade-Villar, J. 2009. Description of four new species of Dilyta Förster (Hymenoptera: Figitidae: Charipinae) from the Afrotropical Region. African Entomology 17: 207-214. Paretas-Martínez, J., Arnedo, M.A., Melika, G., Selfa, J., Seco-Fernández, M.V., Fülöp, D., Pujade-Villar, J. 2007. 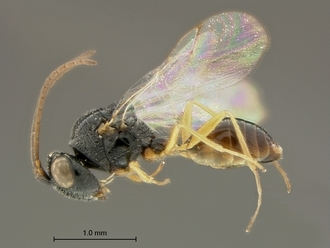 Phylogeny of the parasitic wasp subfamily Charipinae (Hymenoptera, Cynipoidea, Figitidae) Zoologica Scripta 36: 153–172. Quinlan, J. 1986. A key to the Afrotropical genera of Eucoilidae (Hymenoptera), with a revision of certain genera. Bull. Br. Mus. Nat. Hist. (Entomology) 52, 243–366. Quinlan, J. 1988. A revision of some Afrotropical genera of Eucoilidae (Hymenoptera). Bull. Br. Mus. Nat. Hist. (Entomology) 56, 171–229. Quinlan, J. & Evenhuis, H. H. 1980. Status of the subfamily names Charipinae and Alloxystinae (Hymenoptera: Cynipidae). Systematic Entomology 5: 427–430. Photographs © Simon van Noort (Iziko South African Museum).